This OPA structure allows the minimizing of the 3-D image sensors, as small as a dragonfly's eye. Kim said, "It's not an easy task to integrate a tunable light source in the OPA structures of previous works. We hope our research proposing a tunable radiator makes a big step towards commercializing OPAs." 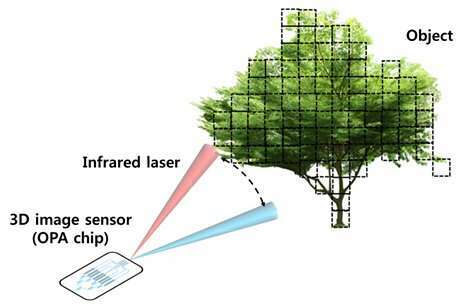 Dr. You added, "We will be able to support application researches of 3-D image sensors, especially for facial recognition with smartphones and augmented reality services. We will try to prepare a processing platform in NNFC that provides core technologies of the 3-D image sensor fabrication."